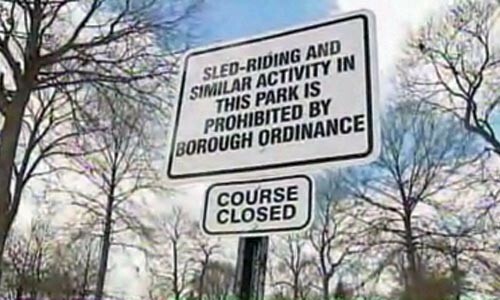 Summary: A local town restricts sled riding and causes outrage! 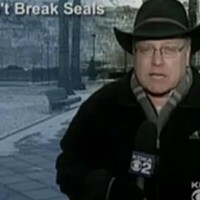 Reporter: Amy Marcinkiewicz, WPXI Channel 11 Airtime: 1 minute, 34 seconds on Dec. 15 Highlights: *When Marcinkiewicz narrates, to the sound of metal striking metal as a sign is pounded into the ground, "With that, they sledge-hammered sledding. Read it for yourself: 'Banned! Prohibited!'" * When a mom is interviewed inside her mom-mobile, clutching the steering wheel (and wearing a twisted-up seat belt -- also not safe!). She reads Beaver's newly planted sign: "Sled riding and similar activity in this park is prohibited by borough ordinance." * When Marcinkiewicz tells us what mom is thinking: "She's flabbergasted -- can't believe it. Against the law to sled here?" * When mom remarks, "That's very sad. [Kids] just wanna have fun. In a small town like this, I think we can care for each other and watch each other's kids." * When Marcinkiewicz reports, "They've been sledding on this hill and water park for years. Now, it's bare. Beaver residents are learning there are big-time rules and regulations to follow before having fun. And get this -- council didn't want to do it." * When Beaver Councilor Shirley Sayers opines, "It's important to sled ride. It's part of growing up. It's part of being a child." * Marcinkiewicz prods, "But what?" Sayers answers, "But the loss-control people with our insurance company said you have to modify the one course, and you have to close the other one." * When Marcinkiewicz hammers away: "To be on that hill, you have to be a Beaver resident. Then you can't be on any type of plastic or metal discs, there are no inner tubes, 12 and under have to wear a helmet, restrictions to keep you safe. Sledding: outlawed, restricted. Winter fun, reduced to just a liability." * When the councilor adds, "It's crazy. To me, it's almost un-American." What We Learned: The Burgermeister Meisterburger lives -- and now he has a law degree. Unanswered Question: Why not just bubble-wrap every kid and be done with it? News Value: 3. Marcinkiewicz's choppy reporting style is hard to swallow sometimes, and adds unnecessary drama. And as much as I'd like to blame all of this on attorneys, that's really not fair, even though Beaver's action was taken in light of pending lawsuits. A recent MSNBC.com article gave a pretty compelling basis for concern: According to an analysis of U.S. emergency-room reports, kids and teens on sleds account for 20,820 injuries a year. Considering you can only sled a few days a year, that's a lot. It's a bummer any way you look at it.